As stated in the title,and after reading the user guide,i didn't quiet get the idea of using offline maps. After downloading a specified map,i import it to offline map, and then what?How an i benefit from it?What are the usage for this maps?Can i set waypoint or other tools like online maps? Sorry if my question seems so basic, but i am still a beginner, and the guide didn't have much info about that. Offline maps allow you to get map displays when you are not connected to the internet. Hi @DonLakeFlyer and thank you for your help. If offline maps is just for displaying them when not connected to the internet, then what's the purpose of it? I mean by that, if there is offline map, then it must have some purpose other than display, but it's display case only, then what is the benefit of having offline maps when we are unable to benefit from it in setting a flight ? You can plan flights, see where your vehicle is flying and so forth. All of QGC works. I've also got some "offline maps" problems here. 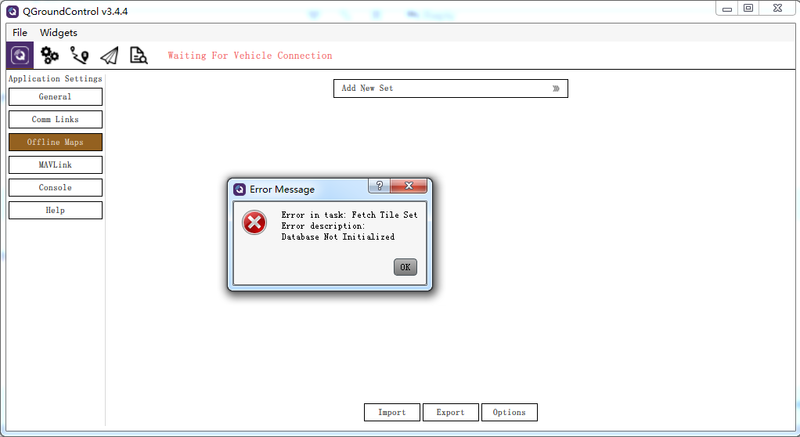 When I click the "Offline Maps" button, a error message of "Fetch Tile Set" happens. Reinstall QGC, this error still remain, help!